It has been an exceptionally busy few years for Tony Foresta and Phil ‘Landphil’ Hall, not only did they start writing material for the new Municipal Waste album following 2012’s ‘The Fatal Feast’, but 2012 also marked the birth of Foresta and Landphil’s side project, Iron Reagan. Iron Reagan has taken a rather large amount of time away from Municipal Waste and although the Waste have continued to tour, their output has been relatively on the back burner. Earlier this year, Iron Reagan released their 3rd studio album ‘Crossover Ministry’, to a hugely positive response with even more tantalising news appearing a month later when Municipal Waste announced that they would release their 6th studio album ‘Slime and Punishment’, later in the year on the 23rd June. What makes Municipal Waste so appealing is that the Waste have always smashed through their work like its 1990. Taking the works of the likes of; Anthrax, D.R.I. and Suicidal Tendencies into their stride, Municipal Waste have created a modern spin on crossover thrash and ‘Slime and Punishment’ is no different. Clocking in at under 30 minutes, ‘Slime and Punishment’ whirls out of the bar and kicks down your front door with an armful of booze in one hand and a stereo blasting ‘Thrash Zone’ in the other. What it is interesting about ‘Slime and Punishment’ is that it is difficult to tell when ‘Crossover Ministry’ ends and ‘Slime and Punishment’ begins as working in the more politically charged climate of Iron Reagan has obviously had an effect on Foresta and these expressions have made their way onto ‘Slime and Punishment’. Drop kicking into action with the initial promo release from the album, ‘Breathe Grease’ smashes into action at the breakneck speed associated with Municipal Waste as Foresta and company stick up their middle finger and protest that they have never cared for your world. The politically conservative world also erodes its way into the album via the title track, with its fist in the air chorus chant, whilst ‘Poison the Preacher’ tackles the overlooking of the abuse of children by the church by instigating vigilante justice, to the tongue in cheek view of the superficial lifestyles that reality and celebrity cultures have instilled in the masses with ‘Amateur Sketch’ and the Suicidal Tendencies crossed with Megadeth romp of ‘Parole Violators’, complete with amusing samples of a poor sap being pulled by the police after breaking parole. 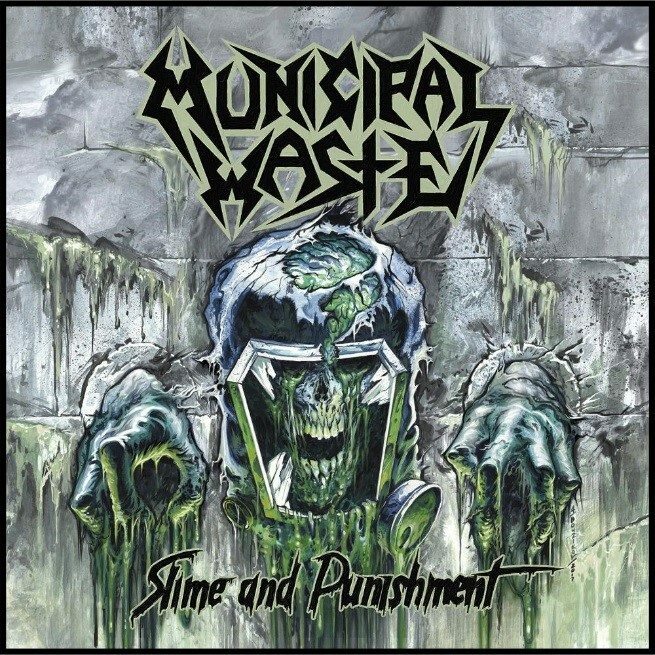 However, there is plenty of old-school Municipal Waste stylings here on ‘Slime and Punishment’, who can deny the party ‘til you puke atmosphere of ‘Enjoy the Night’ and ‘Excessive Celebration’ or the chance to dance the toxic waltz to ‘Shrednecks’, guaranteed to the pass on a whiplash claim or the mighty sledgehammer assaults of ‘Death Proof’ and ‘Think Fast’ are all examples of how the Waste can still explode a room into a menagerie of whirling dervishes, as torn denim and leather clash becoming stained by alcohol, blood and vomit. The only real downside to ‘Slime and Punishment’ is the instrumental ‘Under the Waste Command’, which is the filler of the sandwich in between ‘Low Tolerance’ and ‘Death Proof’ and unfortunately, just fades into obscurity.